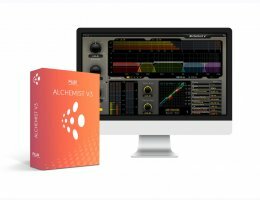 Be it a serious problem with the dynamics in a mix, a delicate mastering assignment, or a situation with complicated dynamics, Alchemist provides everything you need in order to accomplish. Designed with professional mastering and re-mastering applications in mind, the intricate design, superior workflow, and sound perfection, makes Alchemist tailored for the high demands of today’s music and pro-audio industry. Angel's share and Hysteresis are key features of all Flux dynamic processors, using the dynamic range content of the signal and not just the signal levels as standard processors do. Angel’s share controls the amount of auto-ratio determined by the signal dynamics and by the manual ratio setting. Hysteresis controls the amount of auto-threshold determined by the signal dynamics and by the manual threshold value. Auto Delay (Introduces a delay line in the processed signal allowing zero attack time). Dynamics processing envelope control (Attack, Hold, Release with optional Auto mode). Input / Output gain control.